Check out a preview of our new ebook at Amazon or at Google Play Books! Greetings again to my readers! This post continues the story started in the previous post. First let me recap briefly. I have spent almost two years writing an ebook about our former furniture refinishing and antiques business. 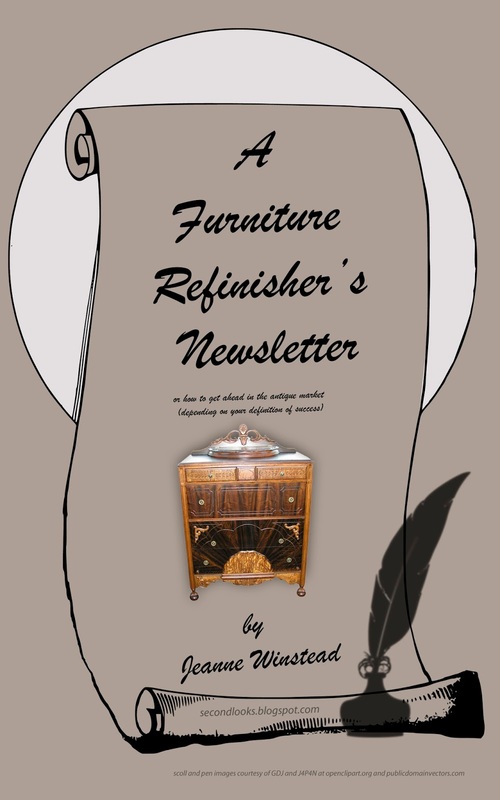 That book A Furniture Refinisher's Newsletter is finally finished and available for purchase at Amazon and at Google Play Books. But even though I'm finished (finally! ), it turns out I'm not; I find that the contented albeit often lonely experience of writing this ebook has left me with a lot to share and talk about! So let's talk shop! Who among you, my readers, is currently contemplating writing an ebook? If you are, then I hope this post provides some helpful sign-posts along your journey. What I shared in the previous post is just one of the hurdles I encountered in my ebook-writing adventure. And that hurdle was more about the technical aspects of promoting your book on your own website than it was about creation. So ... here's the rest of the story. I had enjoyed reading books on my iphone, especially while travelling for extended periods. I had also purchased short ebooks written by photographer Stephanie Laird for her tips and tricks. I guess these experiences inspired me to attempt an ebook of my own. I had several ideas for topics and had been searching (floundering, actually) for a place to start. 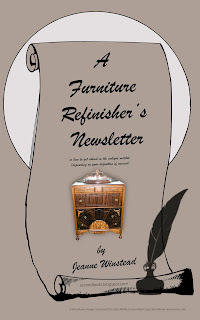 Well, on this blog I had a post entitled A Furniture Refinisher's Newsletter. This post had formerly existed as a scrolling news page at our Second Looks Furniture Refinishing website. 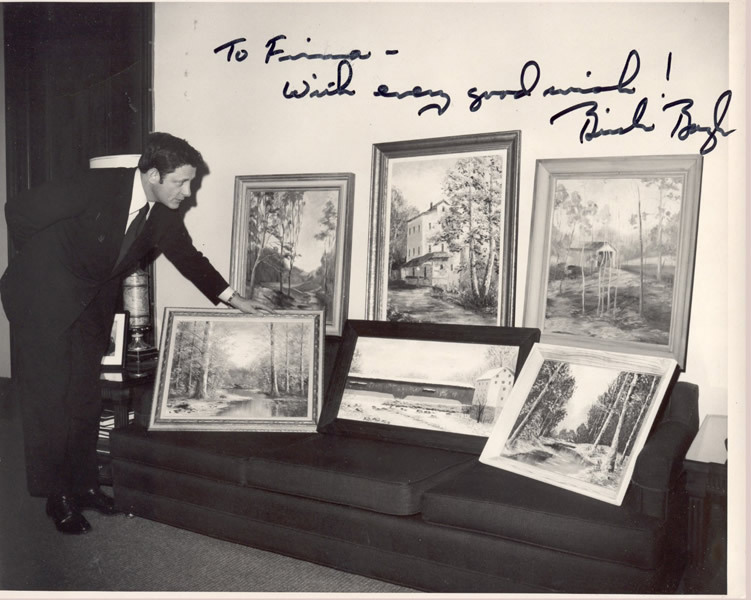 In 2009 when we got out of retail I moved the news page to this blog, thinking I would continue sharing news about Ben's refinishing activities. I never dreamed that this post would become the most visited post on my blog! It received more visitors than the posts about Aunt Firma and about the Cafe Rienzi. I had no idea why. Unlike the posts about Aunt Firma and about the Cafe Rienzi, nobody ever commented. So I didn't know if anyone was actually reading the thing or whether they just landed there by accident. I did some research on how people were finding it and finally decided, yes, this post might be a great choice for getting my feet wet with writing ebooks: it had a matured concept, it seemed to be popular, and it was originally designed not as a paper- or hardback book but as web-based communication. Therefore transforming it into an ebook should be fairly simple and quick. The process began with educating myself about what other people were doing and about choices in ebook publishing. I mean I had NO idea of how stuff worked. Format decision, for instance: flowable or pdf? I played around with these options but knew in the end that I wanted people to be able to re-size the font and use all the features that their ebook readers or apps offered. There was no need for complicated tables or columns or layouts. Just the text, ma'am. If I needed to do multiple photos to illustrate a point, I would use Photoshop to combine them into a single illustration - eg., a before and after collage - that immediately followed the paragraph that described it. I incorporated my captions into my illustrations so I didn't have to worry about page breaks occurring between the image and its caption. I had some very definite ideas about what I wanted my readers to experience. Not only did I want them to have flowable text, but when there was a picture, I wanted them to be able to tap, pinch and zoom in for a better look (if they so desired). I decided to do my book for Amazon Kindle and sell it on Amazon, even though all the reading I had done recommended selling it from your own site to maximize profits. Yeah, that would work I guess, if anyone ever visited my "viewportless" sites, lol! I wanted the power of Amazon and Google behind my little ebook. Amazon has some pretty good, clear, easy to follow advice for ebook preparation and submission on their KDP Direct site. No, I didn't want to do my own XML (another widely used markup language that's the basis of just about everything these days) - I wanted to write the book in Word. Amazon gives very clear guidance for how to do that (albeit a little less guidance on how to upload your final product). What Amazon didn't provide (in my opinion) was a decent previewing experience. They provide a minimum-feature previewer (an emulator) on their web-site that is unresponsive to touch and many features the real devices have. I thought it was absolutely essential to preview the book on the real thing - phones, tablets, and computers. So I had to figure out how to do that. In my research I came across a piece of software called Calibre that was free (but that deserves any donation you can give it) and that converted my Word Document into ebook format so that I could preview it on my phone's and tablet's Kindle apps - if I could figure out how to get the file onto those devices, lol. It was probably in Calibre that I learned/realized that there are actually different flowable ebook formats. Amazon Kindle requires a propietary format called AZW. Then there are the ePUB and the MOBI formats. Anyway, when I finally figured out how to send Calibre's output to my phone and tablet's Kindle Apps, I was very disappointed in the quality of my images - which I had literally spent HOURS and HOURS and HOURS processing. I had a lot of images in my ebook, double what I had originally planned. As I said I wanted users to be able to zoom in on the full-size image so I worked hard to achieve the requisite quality and perfection. With a lot of trial and error and comparison with Calibre's output of my ebook in the various formats, I FINALLY figured it out. It was the size. My original Word doc and images amounted to about 163 megabytes in size! Amazon's format was around 15 megabytes. Amazon's upload requirements and conversion process were downsizing and degrading my images! I really struggled with that one for a while. I experimented with workarounds and "hacks." Here's the main disadvantage of self-publishing on Amazon: there is absolutely no one to talk to, at least not easily. I guess you're supposed to hire the experts for advice. I finally surrendered to the fact that Amazon wasn't going to easily accommodate a 163 megabyte flowable ebook and that was probably a good thing. A book that size would take forever to download, would use up people's data, and would likely not even fit on their readers, tablets, and phones. Duh, Jeanne. So I decided to let Amazon do whatever it wanted (15 megabtyes still makes for a pretty hefty ebook) and I would upload the full-sized images to my website and link to them in my ebook. If people really wanted a close-up view of something, they could click on its link and view the image in their browser. I downloaded a web gallery app called Web Album Generator that I could use to create and customize an online gallery of my photos. It was simple, very nice, very easy freeware or shareware. After some experimentation to see how well (or not) my idea would work on my iphone's Kindle app, I created the full-fledged gallery, used Dreamweaver to upload it to my website, and worked through the book (again) to add all the links. About the images ... I spent a LOT of time on these to ensure the best viewing experience for people. Not that all my images were great to begin with because they were taken for the business on various cameras over the past 20 years and let's face it: my photography has somewhat improved over time. ;) I used Photoshop to extract many subjects from their backgrounds (cut-outs). I tried to be creative in framing my images and illustrations. That got me into a whole 'nother can of worms - copyrights. I had to make sure that any decorative frame element I used or modified was credited to (and that I had obtained permission from) the original artist. Or else I had to make sure I was using only public domain stuff. And what do you do about people's names? Many individuals are mentioned in my book, because quite frankly, "it takes a village." But do you use their real names? Do you ask every single person for their permission? Some folks had moved away. I settled on changing the names in the book to respect people's privacy, except in the case of well-known businesses and their owners. So, that's about it .... except for the marketing phase, which is ongoing. Amazon has you create an author page and write "an about-the-author blurb" as well as an intro for the book page. Google also requires that. Although it was strongly recommended, I didn't have proof-readers. I hope that isn't too noticeable. Who was I going to ask? I hated to impose on anybody to ask their time when maybe it was something they weren't really interested in. And to be honest, I was afraid that people would hate it and force me to completely rewrite it ... lol. I hoped that maybe this book would generate enough income that I could afford more professional help on my next book. I have read and revised the book many times over the course of two years and have done the final proofing on different devices (or their emulators). I have tried to systematically check and catch all inconsistencies, but really ... there comes a time when you just have to say, "It's done already." Like a piece of antique furniture or an old house, if the book has quirks, so be it. It has a quirky topic written by a quirky author. Hopefully it will attract quirky buyers who can appreciate its intent. So I was done! I had started the book in January of 2016, let it sit during spring planting, picked it up again in the fall, left it again when family health issues required frequent trips and care-giving duties, worked on it as I could during the summer of 2017, let it sit again during my mother's illness and finally finished it in December! During one of my final proof-readings, I realized I hadn't supplied alt-text for the photos either in my ebook or on my online gallery. Alt-text provides a rich experience for those who are blind. I realized I couldn't leave the generally inaccurate descriptions Word had automatically inserted in the alt-text field for each image. So once again, I worked through the book and the online gallery. I discovered in writing alt-text, that I literally needed to re-paint the picture with my words, albeit briefly. It would have been more efficient for me to supply the alt-text when I originally inserted each image - because I did have to coordinate somewhat between what I already said in the text and what I wrote for the alt-text. I had to keep asking myself, how will this all fit together for a blind person reading this book? So I was finally done! Again. It had never occurred to me to preview the book in black and white until I took another author's advice and previewed my manuscript on Amazon's Paper White emulator. Oh, no. Can you picture me bowed over my computer desk, my face buried in my hands? On one of my favorite websites, YouPic, other photographers had introduced me to the wonders of black and white photography. But it never caught on fire with me personally. I prefer to work in color. Oh, I wanted my photos to pop and have a wide dynamic range and good detail, but I never, while I was processing these photos for the book, considered how they would look in black and white. So it was one more time through the book, and then through the website! (Did you know you could make your Chrome browser display in black and white with its gray-scale and high-contrast theme plug-ins? At the touch of a button! Look for these apps in the Chrome store.) Working my way through the photos, I noticed that a few didn’t work at all because the color was an essential part of the picture. Fortunately quite a few photos looked pretty good once my eye adjusted to loss of color. In fact the details were were actually enhanced by the lack of color! In some photos the details were too enhanced, making it difficult to sort out the main subject from its background - I think the term for that is "good field-ground separation,” which I learned does not necessarily translate to wide aperture. Finding a medium gray on which to meter and using soft light are essential if you are wanting a wide graduation of gray for good detail. Anyway, after taking a final look I decided to say good enough for this book. If I had it to do over of course, I would look at the photos in black and white as well as in color in the design stage to make sure my ideas were coming through. I probably would have made my photos lighter and in some cases less contrasty. I also would have also given more consideration in the design stage to what color text and background would enhance both black-and-white and color images. So, lesson learned, hope it helps the next guy reading this who wants to write an ebook! Anyway, have a wonderful Holdiay season! I'm hoping Santa (or Somebody) will bring me sales for this little niche-market creation, which is intended for furniture and antique lovers or those who love to go to antique malls and flea markets; for the DIY crowd; for the novice furniture refinisher; and for the prospective entrepreneur who wonders how to market his or her antiques and refinishing business. *I do realize that I might have been able to use a database, and probably xml, and dynamically generate link requests by passing a unique photo id to a php script – but I was already undergoing MAJOR cognitive overload just trying to figure out ebooks (specifically mine). That kind of programming task was way beyond my immediate reach! So for now, anybody who buys the book, has hard-coded links!